Every year, in the special time of Khag HaMatzoth (The Festival of Unleavened Breads), believers are commanded to rid their lives of any KHAMETZ (leaven). For one week, we are expected to separate ourselves from what is otherwise a common staple in most people’s lives, removing all manner of baked goods that contain yeast in their ingredient list. There is to be found not a trace of the product in the homes of the faithful. 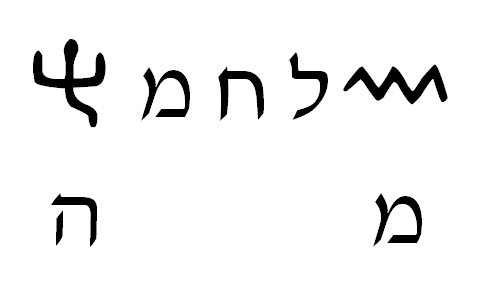 The image below is the Hebrew word KHAMETZ (leaven). Instead of eating leavened bread, believers are commanded to replace it with MATZAH (unleavened bread). Bread lacking the necessary yeast to rise and become the fluffy, doughy loaf enjoyed as the norm for the rest of the year is the only type of bread allowed believers for one full week. Matzah is usually rather thin, compared to the thick leavened bread. It is visibly different than bread containing yeast. It looks very much like a cracker, and tastes rather similarly, if unadorned with salt or other seasoning. This strange act is a portrait of us who have been redeemed by the Lamb of the Holy One – Yeshua – forsaking our old ways and the so easily-infected-by-sin matters of the world, and seeking spiritual sustenance from above that is pure and without any hint of sin. This time is thus a very symbolic and introspective week of seeing all the ways that sin can enter into our lives, as well as seeing the triumph we can experience when we choose to live by HIS Spirit-filled Word, to take His will into our trust and let it be done in our actions. It is not an easy experience, nor is it altogether enjoyable (there is a reason Scripture calls matzah "the bread of affliction"), but through it we learn that living this way can be done. Most importantly, however, we should learn that living this way is for a purpose. That purpose is not the here-and-now, for the most part. The purpose of living this way now is to reap a benefit at a future time. One can only reap what one has sown. In the week of Khag HaMatzoth, in our obedience we sow a period of khametz-free life and a taking-in of matzah, symbolizing the removal of sin and the reception of righteousness, and know that in a time to come we shall reap beyond what we can dream. The symbolism of receiving this unique bread becomes even more defined when one realizes that Yeshua teaches that matzah is a portrait of His own body! Once the time of Khag HaMatzoth is passed, we are free to eat as we please until the Fall, until the fast of Yom HaKippurim (The Day of Atonements). We can eat as we like, but my hope is that we take things learned from our time of a khametz-free environment and let them positively color our lives for a good while to come. Consider this: in the timing of events during the Exodus story, the people left Mitzrayim (Egypt) and began a trek into the desert. Pharaoh had only been told they would be leaving for a three-day trip to worship Yah, which is why he became furious and acted completely surprised when he was later told they had fled. This fact means that they had already gone three days into the wilderness before being pursued. It is safe to assume that by the time he had caught up with them, a full week had likely passed. As the people became closed-in below the cliffs near the eastern side of the Sinai Peninsula they would have moved at a much slower pace, making the otherwise swift escape take much longer. He showed Himself to be all-powerful here. He commands the very laws of physics, even – able to manipulate the boundaries of the natural world and show Himself to be in control of everything (even on a good day water doesn’t stand up by itself). This act came about because the people were willing to trust Him and actually DO the commandments He had given – the call to sacrifice the lamb and to eat matzah for a week. The principle is obedience to Him because He is over all. They obeyed and got rid of the khametz and took in what He said was acceptable, and so we see them reaping an amazing benefit from His hand! This underlying principle of obedience through sowing and reaping is a key factor to the festival, but more so, for all of our lives. It is this factor that I want to focus on for a little longer, and we shall see how it is contained in the bread we are called to consume on Khag HaMatzoth. What does this mean? It is a command to be willing to give, to let go of what you have, and trust that the Holy One will provide in the future. In prophecies, the presence of water is a symbol for many peoples. Since this is not intended to be taken literally, the symbolism can still be applied here: give sustenance to many peoples – be willing to help and in a time of your own need, the favor shall be returned to you. The term for “bread” in the above verse is LEKHEM, but is inflected grammatically as LAKH'MEKA, meaning "your bread." Generally, LEKHEM signifies leavened bread, but can also mean matzah, if the context determines it to be so (as when matzah is called LEKHEM ONI in Deuteronomy 16:3). Notice that we are to send it forth (get rid of it), and in many days “you shall find it.” The Hebrew there is a subtle play on words due to the inflection of the term “find.” This term in its normal, uninflected state is just MATZA "find." It is phonetically identical to the term MATZAH (unleavened bread), just spelled one letter different. Therefore, we send forth lekhem and in many days, we "find it" / "matzah!" The wordplay would not likely be lost to the original readers of the passage. So it is that a change takes place in what we give. It becomes something else than what we have sown. It becomes a pure thing, related to His unique Presence! YHWH, the pool of Yisra’El, all who leave You shall be shamed; those who flee Me shall be written in the earth, for they left the fountain of living waters – YHWH. And in joy you draw waters from the wells of salvation. The waters can be healed to such a degree that we are drawing forth men from the stock and store of salvation Himself – for the word here in the Hebrew is nothing less than the amazingly prophetic term of YESHUAH – that word from whence ultimately comes the Name of our Redeemer: Yeshua! He is the One from whom we can drink of the waters of life, and all who are healed will be of Him, as well! And you shall serve YHWH your Elohim, and He shall bless your bread and your water; and I shall remove sickness from your midst. He blesses us so that we can in turn be a blessing. When we remove sin from our lives and seek to live by His Word, we have sustenance from Him. He provides for us spiritually. Furthermore, we have the ability to give to others – spiritually, emotionally, and physically. When we are receiving from Him we overflow, and that is the moment where we see that the waters are blessed that receive the bread – we give to others at this time! Encouragement, a word of hope, positive correction, teaching, or whatever it might be – that is our giving to others, and through it we are further blessed! The above passage speaks about Him removing “sickness” from our midst. The above passage speaks about Him removing “sickness” from our midst. 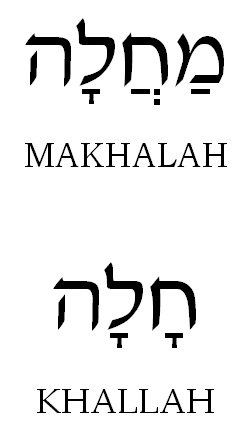 This is the word MAKHALAH, and it stems from the root word KHALLAH. Khallah is often translated as “cake” or “loaf” in English translations. It is typically spelled challah, although the pronunciation is the KH sound. Indeed, just like LEKHEM, it can actually signify either unleavened or leavened bread. The context determines the meaning. So here, if taken as “leavened,” then we see that it is what is “removed” from our midst – the leavening of sickness! He gives bread unto all flesh, for His kindness is forever! He gives bread to all! How He does it is through many means, and what a blessing that is that He does this! But He uses us, as well! When we let His Word do its work in us, we become part of His giving! When we are obedient in sowing as He has said and taking righteousness into ourselves, we then have the ability to share with others, to be a participant with Him. What do we share? Well, what have we received? The pure, sinless Word of His Spirit – the message of Messiah who is the Unleavened Man – the Matzah Man! By being willing to give of what we have from Him to others, we are further blessed, for He desires to give to all! He who has a good eye shall be blessed, for he gives from his bread to the poor! The phrase “good eye” is a Hebraic idiom that means “generous / bountiful.” To have a good eye is to have a willingness to give. He desires us to possess His own giving qualities, to be like Him. The Hebrew word for “war” is MILKHAMAH, but stems from the root LAKHAM. 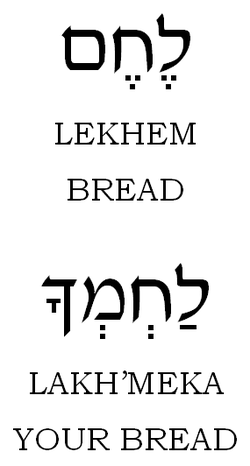 Note that it is spelled exactly the same as “bread” – LEKHEM, just pronounced slightly differently. When we give of our bread / spiritual truths to the waters (people), we give from what we have been given. We can do this because our Creator, YHWH, is a man of MILKHAMAH – “war,” but we can also understand it in the alternate sense of “bread.” He is the man of bread! Obviously, YHWH is not Himself a human, but Spirit, but Yeshua is flesh, who carries the authority of the Most High in His own blood. He is thus the Man of Bread, as He Himself even declares in the book of John chapter 6. Thus, we are becoming like Him by our obedient actions based on faith. What is shown on either side of LEKHEM appears to be waves of water on the right, and a man on the left. Thus, the symbolic interpretation arises that YHWH is a Man of Water and Bread! It is He who gives to mankind. He gives to us through the person of Yeshua the Messiah. He gives to us what we need for true eternal life, and we see it symbolized in His feasts, and it is up to us to share the change we know with others in need of Him! During Khag HaMatzoth, we seek to receive from Him spiritually, and then afterwards, we take what we have received and share with the world as He has shared with us!